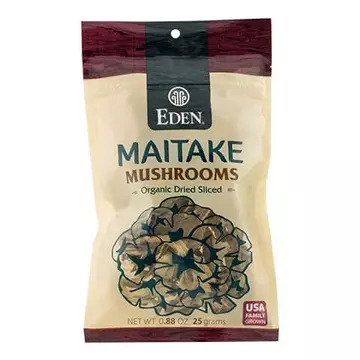 Natural Import Company - Traditional Japanese foods - Eden Maitake - .88 oz. Eden Maitake - .88 oz. Organic, U.S.A. family grown Hen of the Woods, Cloud, Dancing, or Maitake mushroom. A revered culinary and beneficial mushroom. Soak to reconstitute, drain, and use them like any mushroom in stir-fries, soups, stews, gravies, grain dishes, and pasta sauces. Rich in vitamins D and B3 niacin, with good fiber and a rich, succulent flavor. They are called the King of Mushrooms by researchers because of their beneficial qualities.